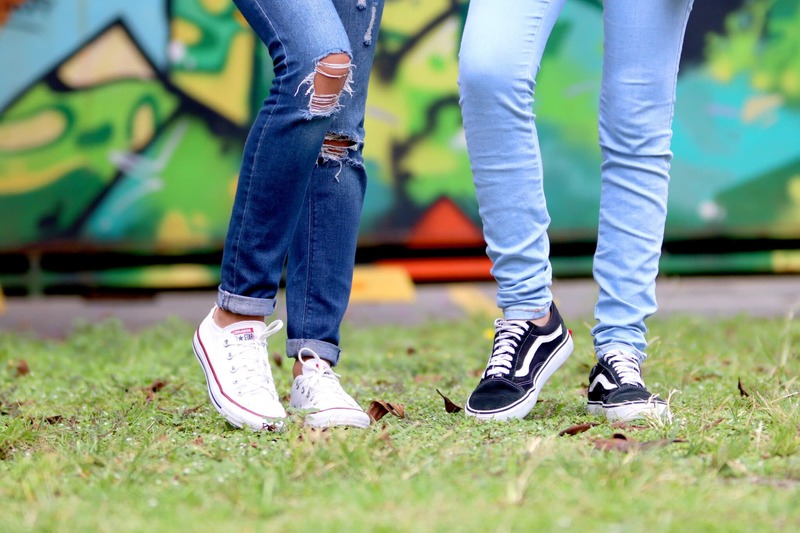 From combat boots and mini skirts to acid wash jeans and high top sneakers, fashion trends are always changing, especially by generation. As we’ve been doing a lot of research into what Gen Z likes to see in marketing campaigns, we’ve also noticed other differences. The emerging debate of “Millennials vs. Gen Z” wouldn’t be complete without a look at the fashion industry. Millennials (currently ages 22 to 37, more or less) and Gen Z (11 to 21 years old, give or take) differ in many ways, including how they dress. Growing up with different economic and social factors impacting their lives, the two generations simply think about fashion differently. Here are three key differences between millennial and Gen Z style. 1. Gen Z wants to feel relaxed. Millennials are apt to dress in ways they believe may help them excel, whether in the workplace or on date night (think clean, conventional shirts and not-too-high heels). Gen Z values comfort and function. For millions of teens today, flowy fabrics are in, tight dresses are out. Gen Zers are more interested in cultivating a spontaneous aesthetic than a perfect put-together look and tend to take a casual approach to style. They operate from an eclectic collection of easy-to-wear, sometimes mismatched, oversized pieces they can throw on and run around in from morning to night. Athleisure is particularly popular, led by classic streetwear brands like Supreme, Vans, Champion, and Adidas, since outfits can go from gym to office to dinner and still look great. Apparel that can fit into any context at any time of day lets Gen Zers work, study, and play without the need for a wardrobe change. 2. Gen Z wants to look unique. Limited edition merchandise, impromptu collaborations, one-of-a-kind items. In this regard (as opposed to how, with socio-political issues, they value inclusivity), Gen Z is into exclusivity — when there are fewer items available, for a short period of time. These digital natives, adept at sharing their lives on social media across Instagram, Snapchat, and Youtube, have no desire to run into someone (literally or digitally) with the same t-shirt from XYZ fast-fashion brand. For them, looking different (cool!) is paramount, and looking weird (even better!) is attractive. It means you’re confident enough to be unique. Diversity, inclusion, and authenticity are just three elements of their all-together-now ethos. Shapeless T-shirts, sweatshirts, dresses, and other low-key staples like denim appeal to Gen Z because they’re effortless and without pretense, which is exactly what they aspire to be. 3. Gen Z wants to represent reality. Since they believe so strongly in owning one’s individuality, Gen Zers are attracted to confident, feel-good, body-positive images. Regardless of size, race, and gender (including non-binary identification), they want to see everyone represented in a clothing line. With every gender-fluid piece, they’re dismantling traditional notions of what it means to have “great style”. The post-millennial generation doesn’t believe perfection exists and expects brands to represent a realistic view of how real people wear real clothes. When it comes to how they decide what clothes to buy, advertisers would be wise to note that Gen Z doesn’t look at models in magazines. Gen Zers listen to more relatable influencers, if not their peers. Furthermore, brands that embrace diversity and also support socially responsible processes like sustainable manufacturing and transparent supply chains are solid Gen Z gold. Just look at how many mission-driven startups are on the rise. Just like generations before, Gen Z sees fashion (whether consciously or not) as an extension of their values. For them, simplicity is akin to transparency, unique items represent individuality, and ungendered apparel invites inclusion. Ultimately, Gen Z wardrobes run parallel to their world views: ultra-realistic and ever-connected. Advertisers who want to focus on marketing during high times for fashion should pay special attention to spring, when every age group sheds their winter wear for lighter clothing. In the US, average order values in the apparel category reach their annual highest peaks in April and May with increases of 24% and 22% respectively, over January. From seasonal peaks to generational preferences, brands that want to win the most sales should be mindful of all these trends. For more on Gen Z, download our eBook.